There are two things that make a dry cleaning business, care and customer service. We care about your garments so we handle them as if they are our own clothes. Because of this we take time to make sure we clean with attention to detail, making sure to take care of everything from buttons and zipper, to seams and collars. We also focus on your whites, brights, and darks, keeping the same amazing color they came in as you pick them up. At our professional dry cleaners we offer dry cleaning, shirt laundry, alterations, and other services. 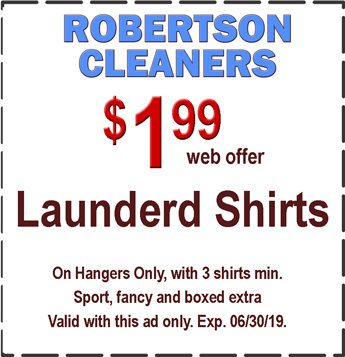 You can trust Robertson Cleaners to have your clothes clean and ready in a timely fashion. Convenience is the first reason. 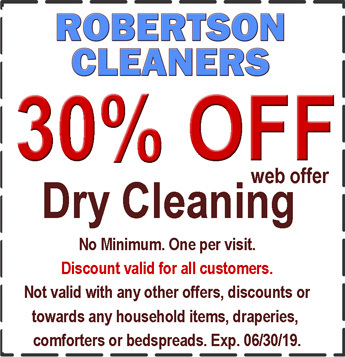 Drop off your clothes and leave the cleaning to us. Pick them up and they’re ironed and ready to wear. Another reason to dry clean is our trained knowledge. Being in the business for 20 years we know what we’re doing. From different fabrics and products, we built a reputation understanding which products to use when keeping your garments with the same look and feel that water from a washer machine destroys. We make sure to inspect each garment for any other issues that you might’ve missed, like an unraveled seam or a loose button. Washer machines using water and detergent still have a hard time eliminating oils and grease. Dry cleaning your clothes preserve them and in some cases it actually restores them (like getting rid of yellow or brown stains that form from being untreated). As the world starts to care more and more about the environment, so do we. With new technology and natural chemicals we’ve joined the eco-friendly way of dry cleaning. We use only the safest methods for dry cleaning that’s not harmful for your clothes and the environment. 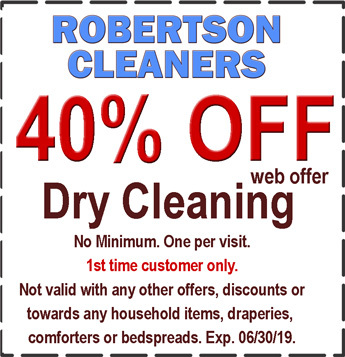 Just another reason to stop by Robertson Dry Cleaners today. We keep you and your clothes looking sharp.